Sigh….yet another essay from Mike about things the fundamentals of which he doesn’t even begin to understand. Get an education before you pretend to lecture either Democrats or Republicans on financial concepts. I have repeatedly tried to engage you in discussions on these matters but you prefer ignorance, even to the point of chiming in with one of even greater ignorance in the character(s) of biomass. The latter can be excused as someone with no commitment to the pursuit of knowledge. But for someone with a PhD from a (supposedly) esteemed institution of higher learning like Ohio State, such disdain for understanding is downright shameful. 4/ If , at some point, enough goods and services are purchased by enough people who have been paid with money that the manpower and equipment available are inadequate, more ^jobs are created^ to provide the services and produce the goods. If anyone else on here can provide one, I wish he/she would. “Money is used to store the Kinesian wealth a worker creates, to be held until he needs to use it. Quite a few “marginally” subjective judgments here, I thought, but at least I could make sense of it. I assume that this those little arrows represent cash flowing. Wealth, in the form of ” food, fertile land, buildings, or other things that sustain us. ” could not, in any practical sense, be used to pay the people who are going to “store the Kinesian wealth a worker creates”. Could it? Our economy is far too sophisticated to return to a barter sytem, isn’t it? 3/ The goods and services man purchases with his earnings/money must be provided by people who are hired to produce those goods and perform those services. 4/ If , at some point, enough goods and services are purchased by enough people (people who have been paid with money, I presume), the manpower and equipment available to produce the goods and services might become inadequate. More ^jobs are created^ to provide the services and produce the goods. I’m assuming that in many—even most—cases a job does not exist before there is a need for it. Am I correct?. If not, is the job just sitting on the sidelines waiting for . . . .something? A simple three- or-four-step ^shuffle^ of money ends up in the creation of a job. I think this may be relevant. A couple more non-WTP sources. So. Taxes pay fireman. Fireman spends money. Some shuffling there already. So. Customer (fireman, let’s say) buys product and that “creates the need for the employees” (jobs?). This still sounds to me like “shuffling money” from one place to another does, indeed, create jobs. Tinker to Evers to WTP? to Chance. Tinker’s money (taxes) go to Evers (fireman) then to WTP (retailer) then to Chance (new employees taken on to produce, sell, and service the product Evers bought and WTP sold.) Shuffle. Shuffle. How, WTP, is that not creating jobs by “shuffling money from one place to another”? OK, this is my last response as I pity you’re wasting your time. You do not understand, nor from all previous discussions with you do I believe you have any genuine desire to understand, the fundamentals underlying even the arguments of the sources you quote. And unlike Mike, who is responsible for educating hundreds of students per year, whether or not you understand is irrelevant and a waste of time. I made a good faith effort to engage you in discussion on this topic and you mocked my effort. As you enjoy brining up discussions from years ago, I refer you to one of your previous replies to me from back then that went something to the effect of FYATHYRIO. Funny that didn’t disturb Mikey given his laser focus on presumed ad hominem attacks. “FYATHYRIO” 🙂 I believe Mike is perfectly capable of understanding the ContexT of that statement. Apparently, you’re not. Allow me to refresh your memory a bit. Simply stated, WTP, I was responding in kind to ‘your’ vulgarity. Simply explained, you began with DS and OBFS. I responded with FYATHYRIO. Understand now? That should clearly and succinctly explain why my FYATHYRIO didn’t set off Mike’s “laser focus on presumed ad hominem attacks (some sarcasm in that, right?) “. ***Do go back to that post in the January 2011 archives— Glenn Beck’s pic in the upper right corner. Caps added to assist understanding. Might I state that, if you truly believe the statement you made (” Shuffling money from one place to another does not ‘create’ jobs.”), you should be able to explain it in light of the information I’ve provided above from the forbes, businessleader, and midimagic.sgc-hosting sites I provided above. Take it one step at a time, if you will, beginning with “Man earns money.” Nothing you’ve provided has shown me anything other than that you have a different opinion about money and jobs than some other people have. Different, for example, than that stated on the sites I provided above. Too bad you chose to ignore my posts, else you could try again to explain to me why we shouldn’t take your response :for what it is.—at best a statement of your opinion and not a statement of fact, and at worst an opinion.based on a specific understanding of the term “jobs”. and their relative value and on a particular view of the role of government. In other words, instead of making a sincere attempt to teach someone who admitted to never having Econ.101, you were heavily politicizing the issue. Note: You can pretend you’re addressing your response to John T Harvey at Forbes if you wish. Obama is like the single mom who keeps heaping bags of chips and candy on her fat kid. She’s doing it because the stuff keeps him sedated. Where are Obama’s spending cuts, Mike? You left spending cuts out of the Republican agenda, and solely focused on tax hikes on the rich. Keep taxes low, cut spending, is this not a classic Republican stance, a stance which America has drifted further away with each passing decade, and now finds itself on disaster’s door? Interestingly, the fiscal cliff is merely a return to the Clinton-era tax and spending levels. Given that many believe Clinton’s years were an economic windfall, why wouldn’t we want to go over the cliff? Some think it would be a good idea to do just that. I focused on the tax matter as the main point of contention and made it clear that I was putting things roughly. My main point here is that congress needs to stop delaying and get to making the tough decisions. They are like bad students, except we’ll be the ones to pay the price. This is all a massive failure of leadership on O’s part. He is still mainly just trying to stick it to the GOP rather than leading the country to a better place. The “fiscal cliff” is a massive failure of presidential leadership. The tedious and technical negotiations are but a subplot in a larger drama. Government can no longer fulfill all the promises it has made to various constituencies. Some promises will be reduced or disavowed. Which ones? Why? Only the president can pose these questions in a way that starts a national conversation over the choices to be made, but doing so requires the president to tell people things they don’t want to hear. That’s his job: to help Americans face unavoidable, if unpleasant, realities. Barack Obama has refused to play this role. Wait until the health care reform takes hold. Wasn’t that supposed to save us money? Bet it won’t. The last I checked, congress has a role in this process. Most members of Congress are responding efficiently to the popular will. A large number of reactionary Democrats reject any measure to touch Medicare or other entitlement programs. A large number of impotent Republicans talk about reducing the debt, but are incapable of forging a deal that balances tax increases with spending cuts. The events of the past few weeks demonstrate that these political pressures overwhelm the few realists looking for a more ambitious bargain. The country either doesn’t know or doesn’t care about the burdens we are placing on our children. No coalition of leaders has successfully confronted the voters, and made them heedful of the ruin they are bringing upon the nation. That’s a very true statement. I don’t think even Mike is heedful. The media hasn’t made people heedful either. There is only one well-known economist or expert on fiscal issues that I know of–Krugman–that says we’re not in big trouble. Since there is a Democrat in the Whitehouse, most of the books about where we’re headed are written by conservatives, whom the media doesn’t want to help by endorsing or talking about their books. The two that come to mind are Niall Ferguson and Mark Stein. There are others. We’ve been warned. A look at the numbers tells even a layman like me that we’re on the back half of the mountain and headed downhill fast. Sorry Mike. After the final outcome, your assessment on blame is wrong. The Republicans “compromised” and got slaughtered. 4 trillion more to the deficit. Just remember, Magus, that O said it was “unpatriotic” of GWB to run deficits. Are we allowed to call O “unpatriotic” for his deficits? And now the left is trashing the Constitution. “Let’s give up on the Constitution” was an op-ed in the NYT. Can we call them unpatriotic? I’m reading that article now and writing a blog entry about it. This is truly disturbing. When a 40 year veteran of education and professor at Georgetown writes an article like that, start to worry. My blog post relates how America’s fall is very similar to that of the French Third Republic, but we have geography to our advantage; France had an outdated cement wall. Which fallacy is the “People have said it before and it didn’t happen so it isn’t true now”, line? The time to worry was nearly 8 years ago when a center-left president of Harvard was run out of office for expressing a differing opinion from certain high-strung members of the staff. Actually, the time to worry was probably 5-10 years before that. Either way, we are well past the time to worry. So-called academics must be held accountable for what they believe. Not for what we imagine them to believe, but we must demand that they back up what they say with actual facts supported by empirical studies and evidence or they must admit the limits of what is knowable due to the inability to produce hard evidence. Deficits should only be run in times of desperation-and we should rarely be in such a state. I don’t think that one editorial writer speaks for the left. After all, would you say that the lefties are distance runners because I run? But the New York Times does, and they control what appears on their Op-Ed page. Really? They speak for everyone left of the right via their editorial selections? I must have missed that memo. Memo to Mike: the NYT is an influential newspaper that tilts left. I know what the NYT is. I used to read it, back in the day. I still don’t recall it speaking for everyone left of the right, though-especially in regards to noting a single editorial. When someone on the Right says something stupid, they represent the Right. When someone on the Left says something heretical, well, let’s split hairs on the philosophical problem of who represents the group. Not at all. When I criticize a specific person, I specify who I am addressing. When addressing a general principle or position, I am careful to select one that is actually generally held. I also endeavor to note the existence of exceptions. I do admit that I can be a bit sloppy when thumbing out a quick reply on my iPod, though. Mike, there is a massive amount of evidence that the Left has little patience with the Constitution. Do you think that the NYT Op-Ed is an isolated case? Do you remember how many Dems were ready to scrap the electoral college back in 2000? Most lefties and righties like the constitution, while disagreeing with interpretations and specific parts. It is, after all, an imperfect and living document. I rather like it, especially since it was amended to outlaw slavery. I’m cool with that change. What do others on this blog think about the link TJ posted? Which post? Not that I’ve read them all thoroughly but I agree with nearly everything he’s stated here. Even if he was wrong, he’d be wrong while standing for something. The Mikeomasses don’t stand for or stand behind anything they say. They poke and prod but weasel out of specifics. I’d like to hear Mike say what specific spending program that is a favorite of the Democrats that he thinks definitely needs to be cut. No wishy-washy crap about cutting “fraud, waste, and abuse”. Programs. Cut. Period. The one above which links to the NYT article on getting rid of the Constitution. Yeah, I saw that about a week ago on Ace, I think. It’s typical lefty sophistry. They’re all for freedom, etc. etc. as long as it’s working for them. This is a problem that has been festering for well over a generation so is it any wonder this day has finally arrived where editors of the NYT would openly question the rule of law? But it’s OK because they’re the “good guys”. Like many oppressors haven’t told themselves that to some extent, including many they themselves quote in the editorial. But much of this isn’t news, it’s what they’ve been complicit to since at least the days of FDR and the abuse of the Commerce Clause, specifically in Wickard v. Filburn (1942). But hey, that was long ago perhaps we can throw that out one day also. Of course I would fully expect the NYT to scream being the sophists that they are. My friend, published author, lawyer, and retired Army Lt. Colonel, Tom Kratman, says Seidman should be put to death. I’m not sure if he’s joking or not. Well, he has the right to express his views. See my comments above @ 3:27PM in regard to your first reference to Seidman. Comment? I’m with Aristotle on the importance of a good constitution. Mike, does the school have the right to fire him for advocating the overthrow of the US Constitution? The first amendment gives him the right to write about such things. In the context of the university, he is also protected by academic freedom. Also, arguing that we should do without the constitution is hardly grounds for firing a person. This is not a crime and would not violate professional ethics, unless he swore an oath to not do such a thing. I think his idea is a bad one, but I think that of many ideas. I blamed both parties, so I would say I was right. Hardly a slaughter for Republicans. We are just taking the scenic route to the cliff-there are a few more deadlines ahead. Cut the deficit. Spend less than the government takes in. Is this difficult? Was this a Democrat agenda? Even Tom Friedman has seen the light. Mike may be the last one stumbling around in the darkness when it comes to Obama’s lack of leadership. Gee, do you think after 4 years as president O should “stop acting as a party leader and start acting like the president of the whole country”? I expect nothing from the G.O.P. It’s lost and leaderless. I expect a lot from Obama, who knows what needs to be done and has said so in the past. I expect him to stop acting as a party leader and start acting like the president of the whole country. When I heard Obama say, after the election, that this time he was going to take his plan to the country, and not make the mistake again of just negotiating with Congress, I thought, “Great, I can’t wait to hear what he says.” But all he took to the country was a plan for increasing taxes on “millionaires and billionaires.” There was nothing comprehensive, nothing bold, no great journey for America and no risks for him. Really disappointing. Maybe Obama has a strategy: First raise taxes on the wealthy, which gives him the credibility with his base to then make big spending cuts in the next round of negotiations. Could be. But raising taxes on the wealthy is easy. Now we’re at the hard part: comprehensive tax reform, entitlement cuts, radical cost-saving approaches to health care and new investments in our growth engines. This will require taking things away from people — to both save and invest. A lot of lobbies will fight it. The president will need to rally the center of the country and the business community to overcome them. He’ll have to change the polls, not just read the polls. He will have to take on his own base and the G.O.P.’s. 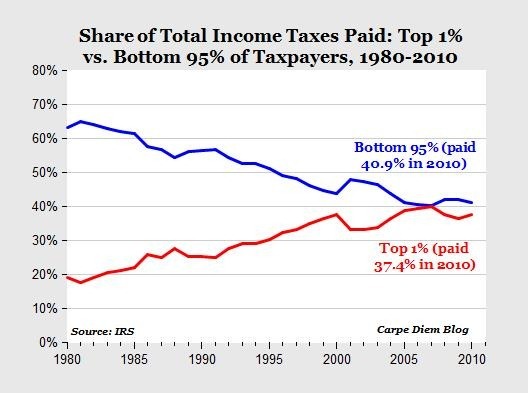 Obama has spent a lot of time lately bashing the rich to pay their “fair share.” You know what? There are definitely some Wall Street bankers and C.E.O.’s who deserve that bashing. But there are many successful Americans who got their wealth the old-fashioned way — by risk-taking, going into debt to start a business or pursue a dream. It’s time for the president to do some risk-taking — to stop just hammering the wealthy, which is so easy, and to start selling the country on a strategy to multiply them. We need to tax more millionaires, but we also need more millionaires and middle classes to tax. The president was elected to grow our national pie, not just re-divide it.